Falkirk and Blair Alston will link up again very shortly – after the midfielder’s old and new clubs were paired together in the Betfred League Cup group stage. Alston signed for Premiership St Johnstone yesterday and his new employers were drawn with the Bairns tonight in the new regionalised group stage of the tournament. 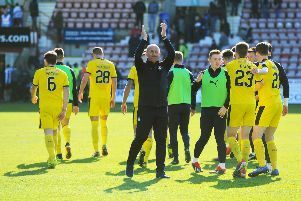 As well as the Perth Saints, Falkirk will compete with Stirling Albion, Brechin City managed by ex-Bairn Darren Dods and Elgin City in Group B.
Stenhousemuir and East Stirlingshire were placed in the southern section of the draw. The Warriors were first of the unseeded teams drawn, and joined with Partick Thistle and Queen of the South, in a group later completed by Airdrie and Queen’s Park. The Shire have two glamour clashes, meeting Premiership sides Motherwell and Rangers and two of the southern-most sides in the draw – Annan Athletic and Stranraer. The group stage is a new format for the League Cup competition, now sponsored by Betfred, as is the manner of settling drawn matches. Each side will be given a point if matches are tied with a bonus point awarded for the winners of a penalty shootout. The draw was made by ex-pros Chris Sutton and Michael Stewart live on BT Sport Europe.